Yes! I traveled to a mountainside before heading to a snowy capped peak just so you could see these views! Say what? Am I kidding? Yes. I actually am. These views are so realistic I actually thought I was there earlier on. But nope, I was actually at LG's new 2017 electronics launch event, where they showcased some of the exciting products which would be coming up very soon! Following the launch of their extremely classy LG G6 smartphone, they continue to spark our interest with the 2017 premium lineup of TVs, Audio systems and IT Solutions. Here are their executives, sharing the exciting launch and updates with us. I managed to snap a shot of the 2017 Lineup for their TVs. Don't we all love TVs... I seriously do. haha. I've seen for myself the extremely sharp and lovely quality of their TV screens, which is one to look out for. We're talking 10 awards here for their signature OLED TV W, my friends. This TV is so special because it has the world's slimmest panel at just 2.57mm! Take two 1-dollar coins and stick them together. That's 2.57mm! Super slim! And you know, minimalists out there would love this - no more unsightly wires for this TV as there's a universal strip cable to keep it all neat, and it's the perfect wall mount (mounted directly on the wall with only magnetic brackets) with minimal gap! Sticks on your wall like the ultimate digital wallpaper! The TV audio is also extremely powerful and rich - using object based sound, mastered in Dolby Atmos that capture every sound of each object. You actually feel like you're there, listening to the pitter patter of the raindrops. The 2017 lineup of LG OLED TVs to look out for include the W7 and G7 (77-inch/65 inch), as well as the E7 and C7 (65 inch and 55 inch). The LG UHG 4K TVs seen here also offers resolution four times higher than HDTV's. Excellent viewing angles, superb colour reproduction, and optimal screen brightness! Also, these TVs are Netflix Recommended, a title which is only awarded to TVs that have passed rigorous evaluation processes such as a fast app launch, easy access, clear display of images and text, etc. No more lag time in switching to your favourite programme! Another feature of their TVs that really impressed me was the Perfect Black TV. This feature enables the TV to have infinite contrast and is 200 times deeper black than other non OLED TVs. This is awesome because non OLED TVs have a grey overcast, marring the visual experience, while the Perfect Black makes it such that at any angle, you'll see the same, deep, alluring black you'll find visually stunning. Look at the HDR feature as well. The colours are brighter and more vibrant, providing a more realistic view for deeper visual impact. These TVs feature the Nano Cell display, and incorporating it with a cutting edge LCD display technology that improves the picture quality considerably. The Nano Cell absorbs unwanted light, and this light absorbing capability reduces instances of colour fading and degradation, improving colour gamut and accuracy! That means a wider viewing angle and no more colour distortion, y'all! Check out these speakers too! Portable and pretty - that's what I would want. Give me this one already (under the PJ series of portable Bluetooth speakers), it's super lovely! I was glad to learn it's also well suited for the outdoors. The speakers feature a turbine blade design that allows the sound to resonate 360 degrees and when using outdoors, no need to worry about adverse weather conditions as it can withstand immersion in water up to one meter for up to 30 mins! But please lah, if you can avoid it, then do so. Don't itchy hand go try, ok? Another speaker which is super cool, people. Check it out, it floats! It's known as the PJ9 speaker, which can be paired with a subwoofer to achieve a truly sonorous audio experience, complete with deep bass. The subwoofer acts as a levitation (a.k.a FLOATING!) station. When activated, the speaker will float and rotate in mid-air! This visual effect is created using powerful electromagnets housed inside the levitation station. Curved TV, perfect viewing around you at any angle. Gaming monitors are extremely attractive looking too. I feel like getting one of these! To be honest, what impressed me was also how they took in their consumers' feedback and updated what bothered people the most, in their next design - which birthed the next edition of the lightest laptop, which weighs only 970grams, bruhs. 970grams! SO LIGHT. This is totally lighter than my entire palm, you guys. 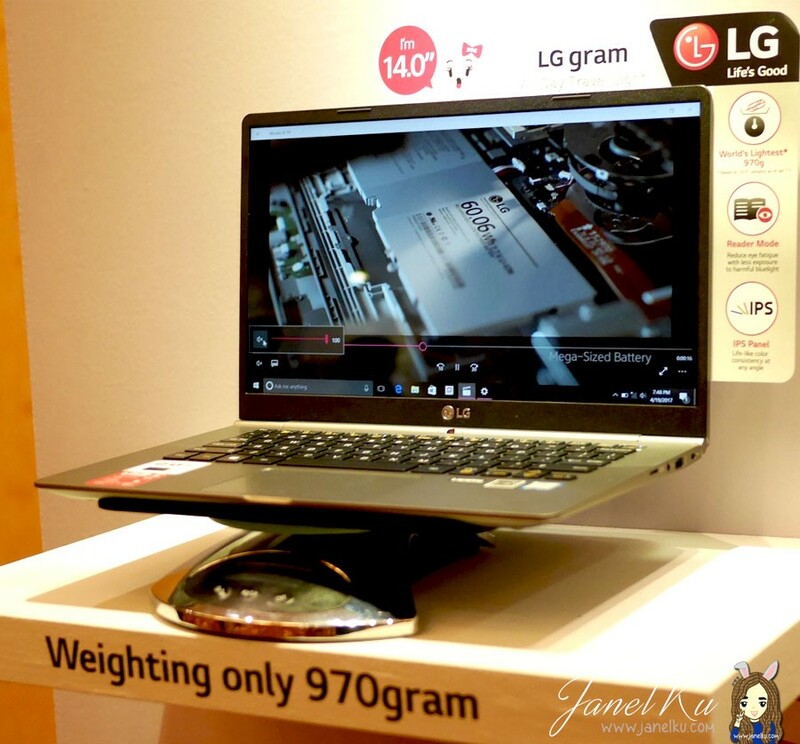 Not sure if you can see it, but this 14-inch LG Gram is perched on a weighing scale, showing its weight - 956 grams, to be exact. 970grams are the maximum weight which the laptop will weigh, so hence, the specs for the LG Gram will be listed as such. 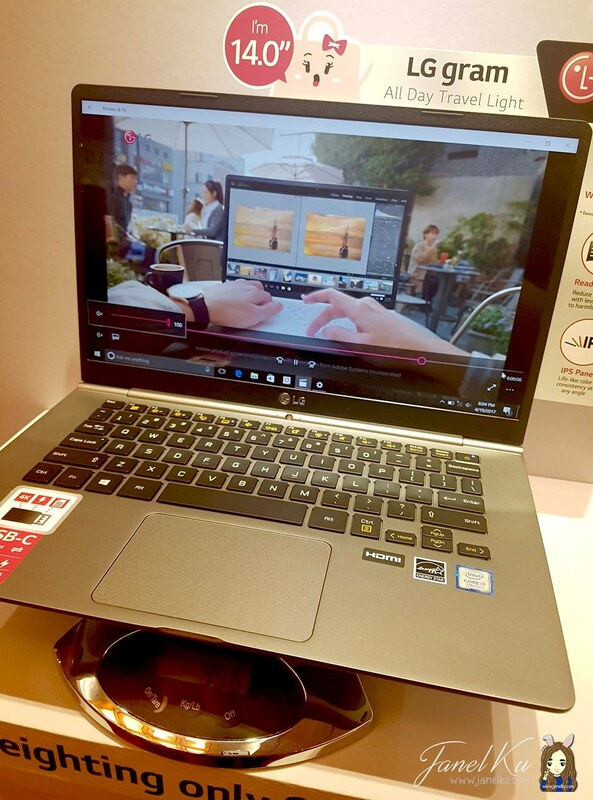 Following the success of the LG Gram launched in Singapore last year, the brand will expanding the series with a 13.3 inch, 14 inch and 15.6 inch laptop bodies, which are all the lightest in their own category. The screen is extremely sharp as well and go easy on the eyes. I'm seriously considering getting myself one of these laptops! 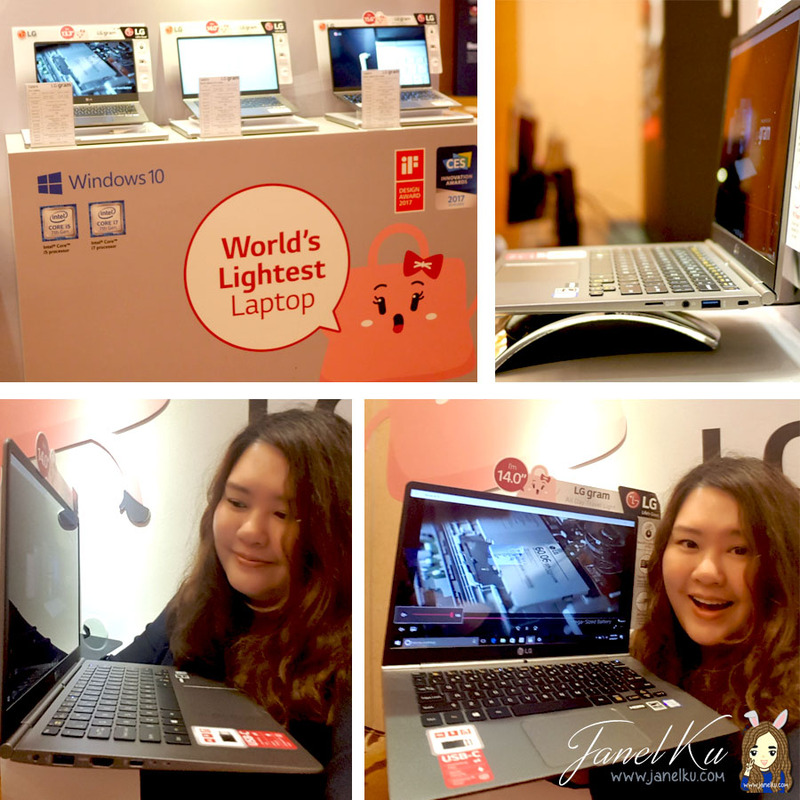 Here's me with the 15.6 inch LG Gram Laptop! The launch for these products is slated to be in the upcoming month. For exact details on launch dates and for more information, please stay tuned to LG Singapore's official website at http://www.lg.com/sg.